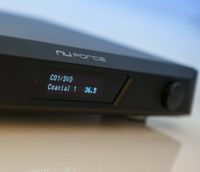 NuForce expands digital range with AVP-18 surround processor and DAC-80 | What Hi-Fi? Hot on the heels of its Mobile Music Pump, NuForce has launched two more digital music products: the AVP-18 surround processor (above) and the four-input DAC-80 digital-to-analogue converter/preamplifier. Selling for £950, the AVP-18 is a fully-loaded surround processor/preamplifier with four HDMI inputs and one output, supports all current HD surround formats including Dolby True HD, Dolby Digital Plus, DTS Master, DTS Hi Res, and is also compatible with Dolby Digital (EX), DTS, DTS ES (discrete and matrix 6.1), DTS 96/24 or 192K 7.1-channel PCM. It runs two dual-core DSPs to handle both hi-res decoding and equalisation simultaneously while retaining processing headroom, and has intelligent room acoustics analysis, coming complete with software and a calibrated microphone, and either manual or automatic equalisation. Digital crossover filters provide selectable slopes for the biamplification of speakers, and there's quadruple bass management for individual adjustment of front, center, surround and rear speakers and 11 fully programmable parametric equalisers per channel. The HDMI section supports 1080P video, 3D, HDMI CEC control and Audio Return Channel, and the reciever also has two optical and two coaxial electrical digital inputs, plus 7.1-channel analogue output. The £695 DAC-80, meanwhile, has four digital inputs – asynchronous USB, optical and two coaxial electrical – and a re-clocking system to avoid jitter, and can handle audio at up to 24-bit/192kHz, NuForce saying that 'No up-sampling or other questionable data manipulation is ever employed'. Volume control is via a 32-bit digital attenuator to maintain low-level resolution, feeding an analogue output stage designed to deliver 4V rms at full output, enabling it to drive long cable runs and maintain signal purity into a power amplifier.